Is 50 Cent Wishing Death Upon Rick Ross While Fighting For His Life? 50 Cent maybe hinting that he had something to do with Rick Ross hospitalization. Rick Ross is currently in a Miami hospital fighting for his life and 50 Cent in on social media being petty. We all know that Fifty hates Rozay’s guts but never knew it was this serious. But then again how can we forget that Rozay’s baby mama is part of the reason why he had to file for bankruptcy. Yes, he currently owes Lastonia Leviston $5 million after losing a lawsuit she filed against him for posting an explicit video of her getting down with another man. Rick Ross was rushed to the hospital early Thursday morning after someone at his Miami home found him having difficulty breathing. There were some reports claiming that he was on life support, but his protege Fat Trel denies those reports. On Saturday, 50 Cent posted two photos on Instagram that speaks for themselves. One of the pics is the infamous van Drago from the classic film Rocky IV. Remember that famous scene where Drago stands over Apollo Creed while he is dying and says, “If he dies, he dies.” 50 Cent sure didn’t need a caption for that and the second pic is that of Al Pacino from the cult classic movie Scarface. 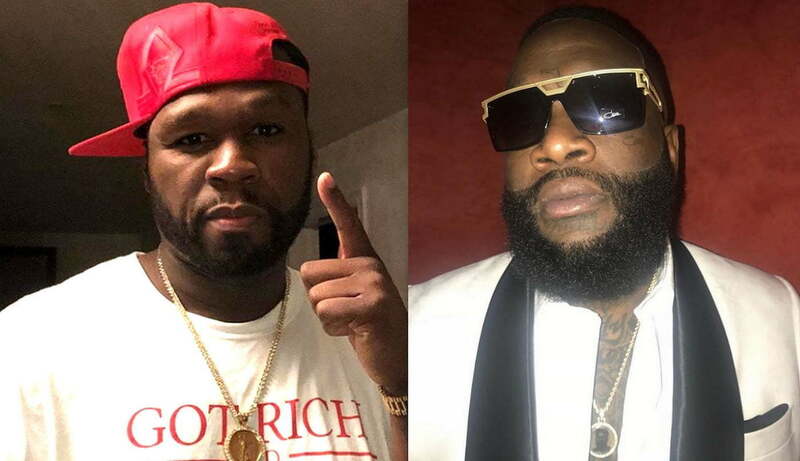 50 Cent and Rick Ross has a long history of beef with each other, but mostly it’s been one-sided with the G-Unit rapper being the one to entertain the feud the most on social media. The New York rap mogul even sued Rozay in 2015 for sampling his classic hit “In Da Club” on a diss track. That case was eventually settled out of court.